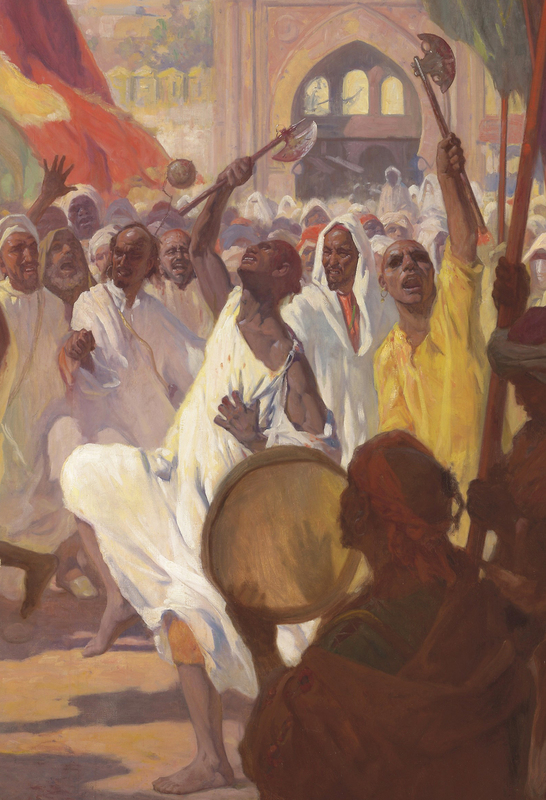 Gordon B. Coutts (Scottish/American, 1868-1937) A Very Fine and Large Oil on Canvas "Ashura Rituals, Tangier" Signed and inscribed: 'Gordon Coutts/TANGIER (lower right). Circa: 1920. Provenance: The Fisher Art Museum, University of Southern California. Gordon Coutts led a peripatetic career, born in Aberdeen, Scotland, he then studied and travelled to Glasgow, London, Paris and Rome before settling in Melbourne, Australia in 1891. In 1896 he moved to Sydney, where he taught at the Art Society of New South Wales, before returning back to Europe in 1899. With the climate of northern Europe detrimental to Coutts' poor health, he moved with his wife, Alice Grey, to the United States where he became a frequent exhibitor at the Bohemian Club in San Francisco. In 1920 he travelled to Tangiers, Morocco where, dressed as an Arab, he passed from tribe to tribe observing the lifestyle, customs and practices of the the village people and Bedouins. The present work depicts the celebration of Ashura. The day of Ashura is commemorated by Shi'ite Muslims; "A day of pain, pilgrimage and pageantry, it is one of the holiest in their religion. The word Ashura means 10, and refers to the tenth day of Muharram, the first month of the Islamic calendar. This is a period of mourning and cleansing, which marks the martyrdom of Hussein, grandson of the Prophet Muhammad. Coutts' visit to Tangiers coincided with the Ashura Festival, at a time when visitors were barred from attending such event. Coutts' natural curiosity and the fact that these rituals had never been photographed led Coutts to adopt a hooded local dress and try to pass unobserved in the crowd. He witnessed the pilgrims clad only in loose white blouses, their feet bare, dancing and leaping like dervishes, singing and shouting along the narrow streets of Tangier. They carried hatchets, bladed weapons and spiked iron balls on chains to self-inflict wounds. The artist recorded the pilgrims lacerating their own skulls, backs and shoulders, the blood streaming down their faces until they eventually drop from exhaustion. Each participant performs these rituals as a form of penitence. 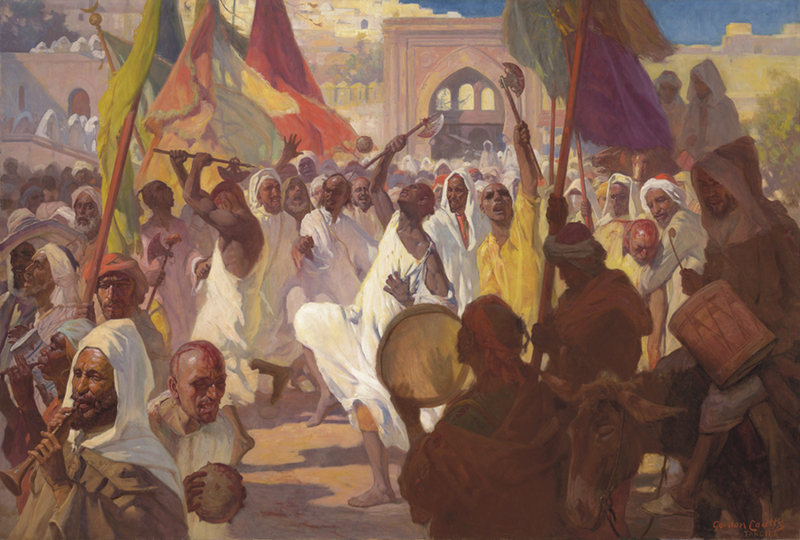 This artwork resembles in many ways the style, colors and features of a large painting by the renowned Austrian artist Ludwig Deutsch (Vienna, 1855-1935) titled "The Procession of the Mahmal Through the Streets of Cairo" which was offered at Sotheby's London, The Orientalist Sale, on April 8, 2014, Lot 7. The Fisher Art Museum, University of Southern California. Gordon Coutts led a peripatetic career, born in Aberdeen, Scotland, he then studied and travelled to Glasgow, London, Paris and Rome before settling in Melbourne, Australia in 1891. In 1896 he moved to Sydney, where he taught at the Art Society of New South Wales, before returning back to Europe in 1899. With the climate of northern Europe detrimental to Coutts' poor health, he moved with his wife, Alice Grey, to the United States where he became a frequent exhibitor at the Bohemian Club in San Francisco. In 1920 he travelled to Tangiers, Morocco where, dressed as an Arab, he passed from tribe to tribe observing the lifestyle, customs and practices of the the village people and Bedouins. 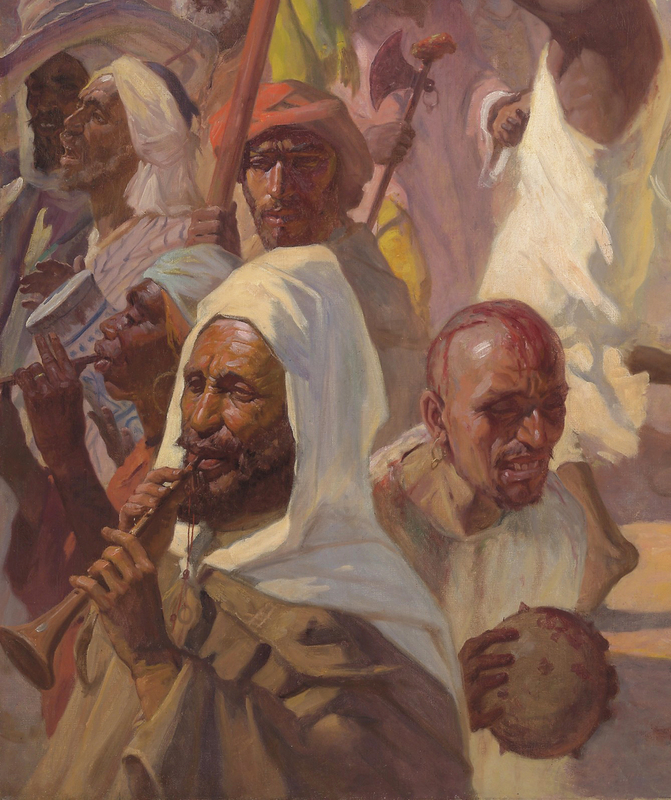 The present work depicts the celebration of Ashura. The day of Ashura is commemorated by Shi'ite Muslims; "A day of pain, pilgrimage and pageantry, it is one of the holiest in their religion. The word Ashura means 10, and refers to the tenth day of Muharram, the first month of the Islamic calendar. This is a period of mourning and cleansing, which marks the martyrdom of Hussein, grandson of the Prophet Muhammad. Coutts' visit to Tangiers coincided with the Ashura Festival, at a time when visitors were barred from attending such event. Coutts' natural curiosity and the fact that these rituals had never been photographed led Coutts to adopt a hooded local dress and try to pass unobserved in the crowd. He witnessed the pilgrims clad only in loose white blouses, their feet bare, dancing and leaping like dervishes, singing and shouting along the narrow streets of Tangier. They carried hatchets, bladed weapons and spiked iron balls on chains to self-inflict wounds. The artist recorded the pilgrims lacerating their own skulls, backs and shoulders, the blood streaming down their faces until they eventually drop from exhaustion. Each participant performs these rituals as a form of penitence.